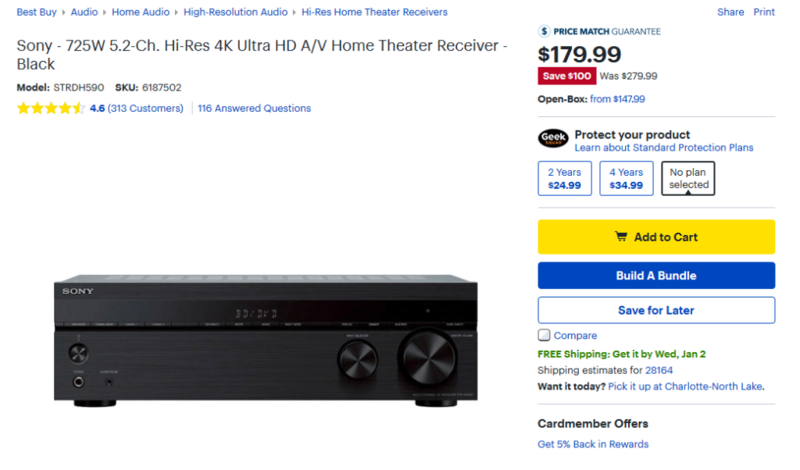 For about $279, or $179 on sale during the holidays, Sony STR-DH590 is the best budget home theater AV receiver you can get. If you have a low budget for your entertainment system or if you are just starting to build a home theater and don’t want to spend too much, this is a perfect option. First, this line of Sony AV receivers look amazing. Besides its good looks, it can support a 5.1 or 5.2 setup with five speakers- front left, front right, center, and two rear ones. It also comes with 2 subwoofers outputs. With multiple input options, 4K HDR passthrough through its 4 HDMI ports, and Dolby Vision support, this receiver is a great home theater starter. For music, it offers hi-res and bluetooth capability. You can enjoy home theater virtual surround with S-Force PRO Front Surround. Sony’s DCAC (Digital Cinema Auto Calibration) automatically optimizes the sound based on where you sit in relation to your speakers to enhance sound quality. Both options are fantastic for watching movies. Of course a lot of how it sounds will depend on what speakers you run it to. But we can attest that in general, Sony receivers produce really good audio and packs a great punch when compared to similar priced receivers from other brands. For watching TV shows, its best to user Direct mode. It’s Pure Direct mode is also a great way to enhance the audio quality, especially for non-theater encoded audio streams. The 4K pass through option is not setup by default, you must enable it in the settings. The information button is very helpful in letting you know what the audio and video source is and how the AV receiver processing it. If you’re having issues with the sound coming out of the subwoofer, make sure you read the manual and follow the setting recommendations. Set the crossover to 200 Hz and the volume to about half way. This should give you enough of a bump in the thump. In our test, auto-calibration was a bit off and set all the speakers to large. If you have really good floor speakers, it’s best to set the speaker size to small and let the subwoofer handle the really low frequencies. Set the speakers’ crossover frequency to either 80 or 100 Hz. That way, the speakers mid-to-high range can shine. If you are not using it with a subwoofer, then set your speaker size to large so all the frequencies can be passed to your speakers. You can also set your speaker configuration to anything up to 5.2. This means that if you only have front and center channels, you can set the speaker pattern to 3.0 or if you have one subwoofer, then set it to 3.1. The receiver will automatically up or down-mix to the whatever speaker configuration you have. 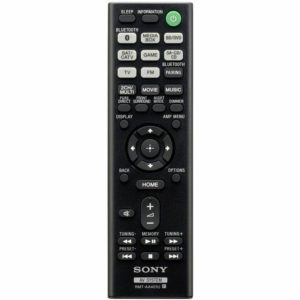 For the sale price of under $200, you really can’t beat Sony STR-DH590’s value in sound quality and options. While Sony doesn’t make high-end receivers, the sound you get is still packed with punch and dynamism. Your ears will definitely enjoy the incredible amount of detail, from natural voices to layers of depth surrounding sound effects. Experience the bigger, clearer picture when you upgrade your home theater setup with the STR-DH590. 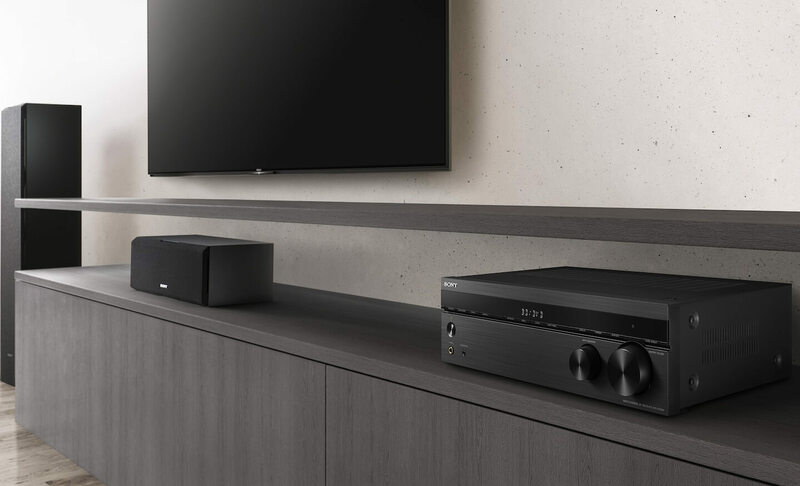 The 5.2ch AV receiver brings movies to life with 4K HDR pass-through, Dolby Vision and flexible surround sound. Bring all your devices together with BLUETOOTH® connectivity and multiple inputs.